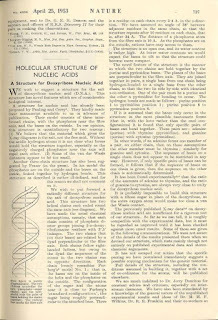 Today marks the sixty-fourth anniversary of the publication of the landmark paper on the structure of DNA by Watson and Crick, which appeared in the April 25, 1953 issue of the journal Nature. Even fifty years later the discovery is endlessly intriguing, not just because it's so important but because in 1954, both Watson and Crick were rather unlikely characters to have made it. In 2012 I wrote a post for the Nobel Week Dialogue event in Stockholm with a few thoughts on what it exactly was that allowed the duo to enshrine themselves in the history books; it was not sheer brilliance, it was not exhaustive knowledge of a discipline, but it was an open mind and a relentless drive to put disparate pieces of the puzzle together. I am reposting that piece here. Somehow it all boils down to 1953, the year of the double helix. And it’s still worth contemplating how it all happened. Science is often perceived as either a series of dazzling insights or as a marathon. Much of the public recognition of science acknowledges this division; Nobel Prizes for instance are often awarded either for a long, plodding project that is sustained by sheer grit (solving a protein crystal structure), a novel idea that seems to be an inspired work of sheer genius (formulating the Dirac equation) or an accumulated body of work (organic synthesis). But in one sense, both these viewpoints of science are flawed since both of them tend to obscure the often haphazard, unpredictable, chancy and very human process of research. In reality, the marathon runner, the inspired genius and every scientist in between the two tread a tortuous path to the eureka moment, a path that’s highlighted by false alleys, plain old luck, unexpected obstacles and most importantly, the human obstacles of petty rivalry, jealousy, confusion and misunderstanding. A scientific story that fully captures these variables is, in my opinion, emblematic of the true nature of research and discovery. That is why the discovery of the double helix by Watson and Crick is one of my favorite stories in all of science. The reason why that discovery is so appealing is because it really does not fit into the traditional threads of scientific progress highlighted above. During those few heady days in Cambridge in the dawn of those gloomy post-war years, Watson and Crick worked hard. But their work was very different from, say, the sustained effort akin to climbing a mountain that exemplified Max Perutz’s lifelong odyssey to solve the structure of hemoglobin. It was also different from the great flashes of intuition that characterized an Einstein or a Bohr, although intuition was applied to the problem – and discarded – liberally. Neither of the two protagonists was an expert in the one discipline that they themselves acknowledged mattered most for the discovery – chemistry. And although they had a rough idea of how to do it, neither really knew what it would take to solve the problem. They were far from being experts in the field. And therein lies the key to their success. Because they lacked expertise and didn’t really know what would solve the problem, they tried all approaches at their disposal. Their path to DNA was haphazard, often lacking direction, always uncertain. Crick, a man who already considered himself an overgrown graduate student in his thirties, was a crystallographer. Watson, a precocious and irreverent youngster who entered the University of Chicago when he was fifteen, was in equal parts geneticist and bird-watcher. Unlike many of their colleagues, both were firmly convinced that DNA and not protein was the genetic material. But neither of them had the background for understanding the chemistry that is essential to DNA structure; the hydrogen bonding that holds the bases together, the acid-base chemistry that ionizes the phosphates and dictates their geometric arrangement, the principles of tautomerism that allow the bases to exist in one of two possible forms; a form that’s crucial for holding the structure together. But they were willing students and they groped, asked, stumbled and finally triumphantly navigated their way out of this conceptual jungle. They did learn all the chemistry that mattered, and because of Crick they already understood crystallography. And most importantly, they built models. Molecular models are now a mainstay of biochemical research. Modelers like myself can manipulate seductively attractive three-dimensional pictures of proteins and small molecules on computer screens. But modeling was in its premature days in the fifties. Ironically, the tradition had been pioneered by the duo’s perceived rival, the chemist Linus Pauling. Pauling who would be widely considered the greatest chemist of the twentieth century had successfully applied his model-building approach to the structure of proteins. Lying in bed with a bad cold during a visiting sojourn at Oxford University, he had folded paper and marked atoms with a pencil to conform to the geometric parameters of amino acids derived from simple crystal structures. The end product of this modeling combined with detailed crystallographic measurements was one of twentieth century biochemistry’s greatest triumphs; the discovery of the alpha-helical and beta-sheet structures, foundational structural elements in virtually every protein in nature. 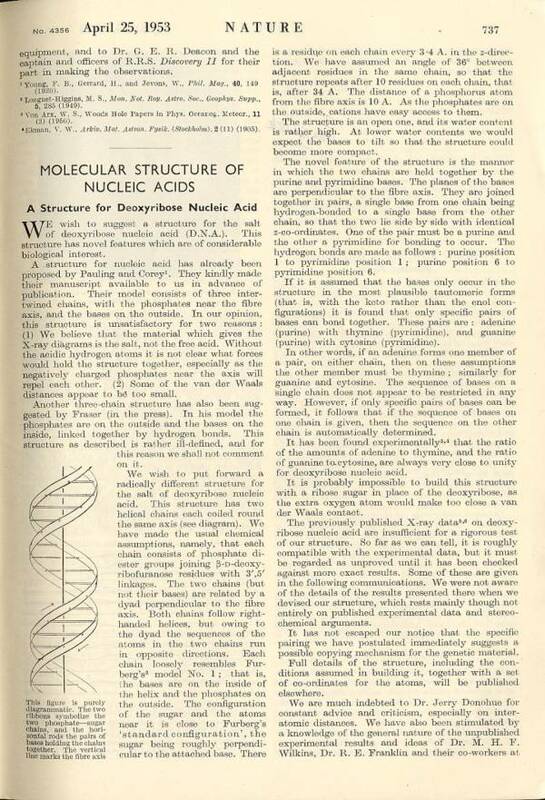 How exactly the same model-building later led Pauling to an embarrassing gaffe in his own structure of DNA that violated basic chemical principles is the stuff of folklore, narrated with nonchalant satisfaction by Watson in his classic book “The Double Helix”. Model building is more art than science. By necessity it consists of patching together imperfect data from multiple avenues and techniques using part rational thinking and part inspired guesswork and then building a picture of reality – only a picture – that’s hopefully consistent with most of the data and not in flagrant violation with important pieces. Even today modeling is often regarded skeptically by the data-gatherers, presumably because it does not have the ring of truth that hard, numerical data has. But data by itself is never enough, especially because the methods to acquire it themselves are incomplete and subject to error. It is precisely by combining information from various sources that one expects to somehow cancel these errors or render them unimportant, so that the signal from one source complements its absence in another and vice versa. The building of a satisfactory model thus often necessarily entails understanding data from multiple fields, each part of which is imperfect. Watson and Crick realized this, but many of their contemporaries tackling the same problem did not. As Watson recounts it in a TED talk, Rosalind Franklin and Maurice Wilkins were excellent crystallographers but were hesitant to build models using imperfect data. Franklin especially came tantalizingly close to cracking DNA. On the other hand Erwin Chargaff and Jerry Donahue, both outstanding chemists, were less appreciative of crystallography and again not prone to building models. Watson and Crick were both willing to remedy their ignorance of chemistry and to bridge the river of data between the two disciplines of chemistry and crystallography. Through Donohue they learnt about the keto-enol tautomerism of the bases that gave rise to the preferred chemical form. From Chargaff came crucial information regarding constancy of the ratios of one kind of base (purines) to another (pyrimidines); this information would be decisive in nailing down the complementary nature of the two strands of the helix. And through Rosalind Franklin they got access – in ways that even today spark controversy and resentment – to the best crystallographic data on DNA that then existed anywhere. What was left to do was to combine these pieces from chemistry and crystallography and put together the grand puzzle. For this model building was essential; since Watson and Crick were willing to do whatever it took to solve the structure, to their list of things-to-do they added model building. Unlike Franklin and Wilkins, they had no qualms about building models even if it meant they got the answer partially right. The duo proceeded from a handful of key facts, each of which other people possessed, but none of which had been seen by the others as part of an integrated picture. Franklin especially had gleaned very important general features of the helix from her meticulous diffraction experiments and yet failed to build models, remaining skeptical about the very existence of helices until the end. It was the classic case of the blind men and the elephant. The facts which led Watson and Crick down the road to the promised land included a scattered bundle of truths about DNA from crystallography and chemistry; the distance between two bases (3.4 Å), the distance per turn of the helix (34 Å) which in turn indicated a distribution of ten bases per turn, the diameter of the helix (20 Å), Chargaff’s rules indicating equal ratios of the two kinds of bases, Alexander Todd’s work on the points of linkage between the base, sugar and nucleotide, Donohue’s important advice regarding the preferred keto form of the bases and Franklin’s evidence that the strands in DNA must run in opposite directions. There was another important tool they had, thanks to Crick’s earlier mathematical work on diffraction. Helical-diffraction theory told them the kind of diffraction pattern that would expect if the structure were in fact helical. This reverse process – predicting the expected diffraction parameters from a model – is today a mainstay of the iterative process of structure refinement used by x-ray crystallographers to solve structures as complex as the ribosome. Using pieces from the metal shop in Cambridge, Watson gradually accumulated a list of parts for the components of DNA and put them together even as Crick offered helpful advice. Once the pieces were in place, the duo were in the position of an airline pilot who has every signpost, flag and light on the runway paving his way for a perfect landing. The end-product was unambiguous, incisive, elegant, and most importantly, it held the key to understanding the mechanism of heredity through complementary base-pairing. Franklin and Wilkins came down from London; the model was so convincing that even Franklin graciously agreed that it had to be correct. Everyone who saw the model would undoubtedly have echoed Watson and Crick’s sentiment that “a structure this beautiful just had to exist”. In some sense the discovery of the DNA structure was easy; as Max Perutz once said, the technical challenges that it presented were greatly mitigated because of the symmetry of the structure compared to the controlled but tortuous asymmetry inherent in proteins. Yet it was Watson and Crick and not others who made this discovery and their achievement provides insight into the elements of a unique scientific style. Intelligence they did not lack, but intelligence alone would not have helped, and in any case there was no dearth of it; Perutz, Franklin, Chargaff and Pauling were all brilliant scientists who in principle could have cracked open the secret of life which its discoverers proudly touted that day in the Eagle Pub. But what these people lacked, what Watson and Crick possessed in spades, was a drive to explore, interrogate, admit ignorance, search all possible sources and finally tie the threads together. This set of traits also made them outsiders in the field, non-chemists who were trying to understand a chemical puzzle; in one sense they appeared out of nowhere. But because they were outsiders they were relatively unprejudiced. Their personalities cast them as misfits and upstarts trying to disrupt the established order. Then there was the famous irreverence between them; Crick once said that politeness kills science. All these personal qualities certainly helped, but none was as important as a sprightly open-mindedness that was still tempered by unsparing rigor, the ability to ask for and use evidence from all quarters while constraining it within reasonable bounds all the time; this approach led to model building almost as a natural consequence. And the open-mindedness also masked a fearlessness that was undaunted by the imperfect nature of the data and the sometimes insurmountable challenges that seemed to loom. So that’s how they did it; by questioning, probing, conjecturing and model building even in the presence of incomplete data, and by fearlessly using every tool and idea at their disposal. As we approach problems of increasing biological complexity in the twentieth century, this is a lesson we should keep in mind. Sometimes when you don’t know what approach will solve a problem, you try all approaches, all the time constraining them within known scientific principles. Richard Feynman once defined scientific progress as imagination in a straitjacket, and he could have been talking about the double helix.